If you ask me, a good moussaka is an absolute joy. I find it to be a real winter warmer, full of flavour and spice, and we all know how wonderfully cinnamon and Christmas go together! I’d go as far as to say that it’s akin to lasagne, but a little less stodgy (so it won’t leave you feeling too lethargic after a big piece!) and perfect for anyone who is gluten free or just trying to lay off the carbs! Moussaka is probably one of the best-known foods to come out of Greece, but its origins are really in Arabic cuisine and variants can also be found in Turkey and the Balkans. However, the moussaka we all recognise today is strictly the Greek twist on the dish and there was no real record of it until the early 20th century! A traditional moussaka is made up of a layers of thinly sliced aubergine, a delicately spiced lamb mince and a cheese sauce (usually béchamel). I can assure those of you already recoiling a little at the idea of aubergine (it’s not the most popular of vegetables I know), that the real taste here comes from that beautiful lamb mince and it goes almost completely unnoticed. The recipe that I am going to share with you is one that my mother gave me when I moved to Durham for my second year, which quickly became a staple and classic ‘Francesca’ dish. It has even been requested by a few people for their personal recipe binders – so I think that we can trust it’s going to be a hit! The one difference between this moussaka and the traditional one is the cheese sauce. Instead of making a béchamel, I use a sauce which turns the top of the moussaka into a bit of a soufflé! Of course, you can opt to use a béchamel instead if you wish! The meat sauce here is one of the easiest I have ever made! In just a few steps, it will be in the oven and making your house smell incredible! Make sure that you are using a pan with a lid which can both go into the oven. Once they have sweated down, turn up the heat and brown your mince. This will take a few minutes, so have patience and be sure to break it all up in the pan! You then want to make sure that you take your tin of chopped tomatoes and blitz it into a liquid using a hand blender (or a normal blender). Alternatively, if you want your sauce a little thicker and chunkier then keep them as they are! You could also use a jar of tomato passata at this point if you prefer. Add your tomato of choice to the browned mince along with the spices, oregano and a squirt of tomato puree. 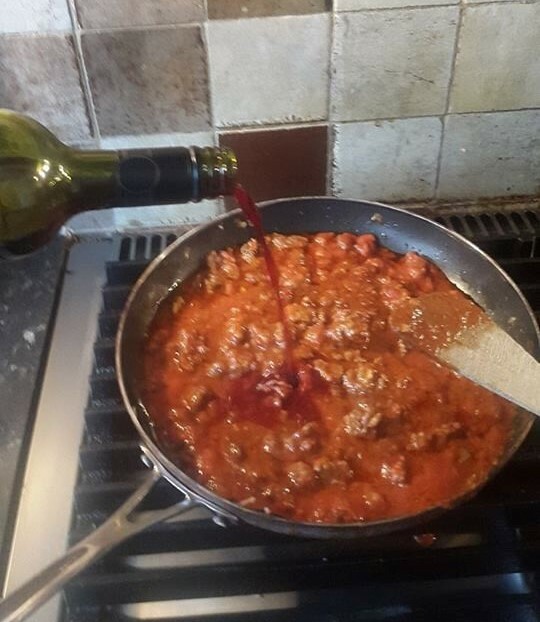 At this point you could also add a splash of red wine to make the sauce a little richer! Make sure that your sauce is a little sloppy, if it isn't at this point then you can add boiling water until it is. Season your sauce with salt and pepper and bake it in the oven at about 160 degrees (fan assisted oven) for an hour. Now that your meat sauce is in the oven, you can start on the aubergine. Spread the rounds out on a baking sheet and sprinkle liberally with salt. Then leave them for 30 minutes as the salt draws out the moisture and use kitchen roll to pat them dry, removing the salt as you go. 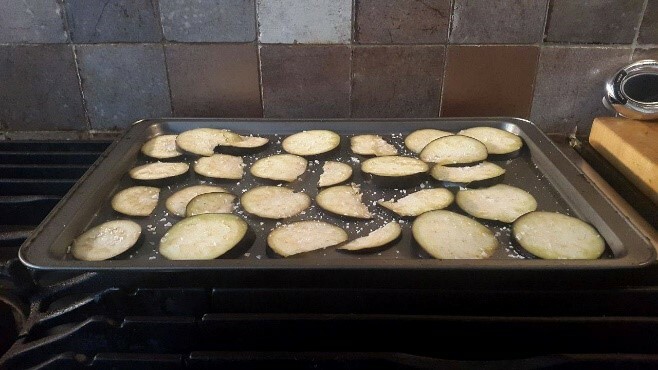 Drizzle them with olive oil and pop them into the oven on the shelf above your meat sauce for around 15 to 20 minutes as you are just softening and cooking the aubergine through. ​Now onto the penultimate step, the cheese sauce! Take your 150ml of double cream, put it into a small saucepan and heat until it is about to boil. You then want to take it off the heat and stir in the cheeses and the nutmeg (remember only a little!). Allow the sauce to cool and then whisk in the beaten eggs and add salt and pepper to taste. Meat sauce, aubergine, meat sauce, aubergine, meat sauce and then pour your cheese sauce over the top, adding a little grated cheese at the end. The moussaka bakes in the oven at 180 degrees (fan assisted oven) for 35 minutes. Leave it for around 10 minutes to cool before serving. And there you have your moussaka! Now it’s time to invite your friends over and tuck in!